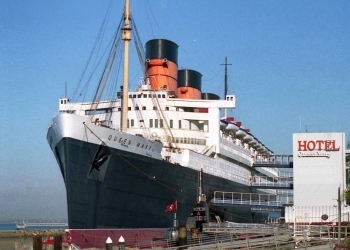 Peter James has been conducting ongoing research at the Queen Mary since 1991, and he claims it is one of the world's most haunted locations. One of America's most respected psychic investigators and a regular contributor to TV's popular Sightings show, Peter has dedicated his life to conducting ghost research. Of the 600 plus ghosts he says that still roam the Queen Mary, he's made personal contact with about 150. The ghosts are as diverse as the ship's history, and some are more vocal and outgoing than others. Some of the spirits that tend be less shy include Jackie -- a small child who died in what was then the 2nd class passengers pool, Captain Jones, one of the Queen's past commanders and John Henry, a worker who regularly roams the ship's engine room. The Queen Mary is a retired ocean liner that sailed primarily in the North Atlantic Ocean from 1936 to 1967 for the Cunard Line (known as Cunard-White Star when the vessel entered service). Built by John Brown & Company in Clydebank, Scotland, Queen Mary along with her running mate, the RMS Queen Elizabeth, were built as part of Cunard's planned two-ship weekly express service between Southampton, Cherbourg, and New York City. The two ships were a British response to the superliners built by German and French companies in the late 1920s and early 1930s. Queen Mary was the flagship of the Cunard Line from May 1936 until October 1946 when she was replaced by Queen Elizabeth. The vessel also held the Blue Riband from 1936 to 1937 and then from 1938 to 1952 when she was beaten by the new SS United States. Queen Mary sailed on her maiden voyage on 27 May 1936 and captured the Blue Riband in August of that year; she lost the title to SS Normandie in 1937 and recaptured it in 1938. With the outbreak of World War II, she was converted into a troopship and ferried Allied soldiers for the duration of the war. Following the war, Queen Mary was refitted for passenger service and along with Queen Elizabeth commenced the two-ship transatlantic passenger service for which the two ships were initially built. The two ships dominated the transatlantic passenger transportation market until the dawn of the jet age in the late 1950s. By the mid-1960s Queen Mary was ageing and though still among the most popular transatlantic liners, was operating at a loss. After several years of decreased profits for Cunard Line, Queen Mary was officially retired from service in 1967. She left Southampton for the last time on 31 October 1967 and sailed to the port of Long Beach, California, United States, where she remains permanently moored. Much of the machinery including two of the four engines, three of the four propellers, and all of the boilers were removed, and the ship now serves as a tourist attraction featuring restaurants, a museum, and hotel. The ship is listed on the National Register of Historic Places.